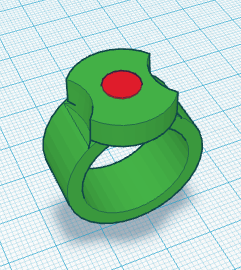 In this project you will design and 3d print a ring that contains a magnet. The wearer of this ring will have magnetic powers that will thrill and amaze those around you. Your design must incorporate at least FIVE shapes. These can be either holes or solids. The red circle represents the magnet. Step 2: use the calipers to measure your magnet. Record these measurements in millimeters. You will need to use these measurements over and over. Step 3: measure your finger. Record the measurement. Save these measurements as they will be added to your engineering notebook. BEFORE YOU BEGIN DESIGNING show me your measurement page with clearly labeled measurements. Make sure that you measure in millimeters (mm). Step 4: start drawing ideas. Show me at least THREE drawn designs before you begin your design. I will sign off on the drawings so that you can move to tinkercad. Save these drawings as they will go into your engineering notebook. Loss of the drawings will result in loss of points.